Registration is now open for the 14th Annual Greg's Ride! Click here to sign up and join us in the Hamilton area on September 22, 2019. All across Ontario, people are riding their bikes in support of amazing causes. 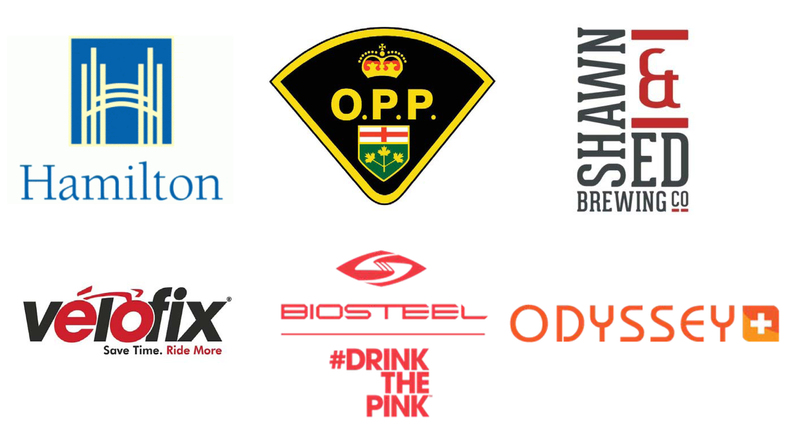 There are rides for heart, rides for cancer and rides for mental health - Greg's Ride: Ontario's Ride for Safer Cycling is the only bike ride supporting cycling advocacy. Every Ontario resident feels safe & comfortable hopping on their bicycle. In 2006, OPP Sergeant Greg Stobbart was killed while cycling on Tremaine Road in Milton. After Greg’s death, his wife Eleanor McMahon founded the Share the Road Cycling Coalition in his memory to advocate for safer roads for all Ontarians. At Greg's Ride: Ontario's Ride for Safer Cycling, we ride in Greg's Memory, celebrating how far cycling has come in over 10 years and striving to making Ontario the safest place in Canada to ride a bike. In 2019, we are excited to once again host the 14th Annual Greg’s Ride in the Hamilton region. Beverages from our friends at Shawn & Ed Brewing Co. The Ultimate ride will be on roadways. The Promenade and Challenger rides will be on a combination of roadways and off-road trails (a mix of paved and hard-packed gravel). Routes are linked in above. Paper copies will be available on ride day. Team discounts of 20% off are available to groups of 3 or more riders. Contact us at [email protected] for details!